Shoyu, as Japanese soy sauce is called, is a dark brown sauce created by the fermentation of soy beans. Shoyu adds saltiness and a savory depth to foods with which it is eaten. 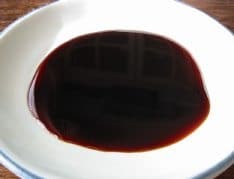 Soy sauce is one of the classic accompaniments to sushi as a dipping sauce and is also the base for many other sauces such as teriyaki, kabayaki, and even in soups. Authentic shoyu is created using soybeans, cracked, roasted wheat, salt and water. These are combined with a special mold starter called koji (also used in sake production) which converts the starches to sugars. The resulting mix (called moromi) is then allowed to ferment for up to three years in giant vats. The resulting liquid is filtered, blended, and aged to achieve the proper balance of flavors, much like wines and distilled spirits. Modern commercial soy sauces, however, are often made with hydrolized soy protein and colorings. If you are buying soy sauce, check the label for the this item to find out if it is real or not. Often, you will pay higher prices for the real item. The ancestor of shoyu is tamari, which was (and still is) made from only fermented soybeans, salt, and water, however in the 1640’s, tamari manufacturers began experimenting with adding wheat to the mix, and thereby producing a liquid with much much more depth of character that the original tamari. Thus was born what we know today as shoyu, or Japanese soy sauce.